We are at the very swanky Glen Helen Resort (later changed name to Glen Helen Lodge), near Glen Helen Gorge and Ormiston Gorge, in the West MacDonnell Ranges. By "swanky" I mean we are in a 4 by 5 metre cinderblock room in a row with a dozen or so others, with an old panelled wooden door held by a single brass Lockwood latch, leadlight rippled glass windows in diagonal pattern held in ancient wooden frames, and a bathroom formed by walling off part of the room with more cinderblocks and a sliding wooden door almost falling off the hanging rail. The bathroom decor is that odd 1970s style of avocado green wall tiles and brown floor tiles. And all this within comfortable hearing distance of the diesel generator that supplies the resort with power. We were shown to this room by a very enthusiastic young man with a British accent, who kept telling us about the exciting things around here. "If you hang out by the rocks there at sunset, you can see wallabies. But I've only ever seen them once. And if you take the helicopter joy flight, I really recommend the Ormiston Gorge flight. Although that's the only one I've been on." He also mentioned the mini fridge in the room, saying we could have whatever was in there free - it was complimentary - but he didn't know what was in there. On investigation after he left us to the delights of the room, we discovered the fridge contained a single bottle of water. We had begun the day at a relatively leisurely 07:00, eating, packing, and checking out of the Kings Canyon Resort. We bought the Mereenie Loop Road pass necessary to drive on the dirt road between Kings Canyon and Glen Helen. Then we drove back to Kings Canyon to do the canyon rim walk. This walk left the car park and soon led up a series of sandstone steps (created by cementing blocks of the surrounding stone into place) up from the plain to the top of the George Gill Range, a climb of about 200 metres in altitude. The red sandstone glowed in the early morning light and looked ancient with weathered brick-like patterns grooved into the vertical surfaces. We climbed behind a long line of tourists who strung out along the steps ahead and above. The car park had been quite busy when we arrived and clearly a lot of people were doing the same walk. We topped the slope and found ourselves in a surreal landscape, surrounded by a plateau populated by dozens of weathered sandstone "beehive" domes - great rounded lumps of rock about 10 metres in diameter and four or five metres high, with cracked brickwork patterned surfaces showing the layers of the stone strata. This was a geologist's dream. The layers of sandstone have been formed by compaction of sand dunes. In places you could see the gentle curving slope of several layers following the outline of a dune, then abruptly cut off by perfectly horizontal layers above. Further along there were the fossilised patterns of water ripples in the exposed horizontal surface that we were walking along. 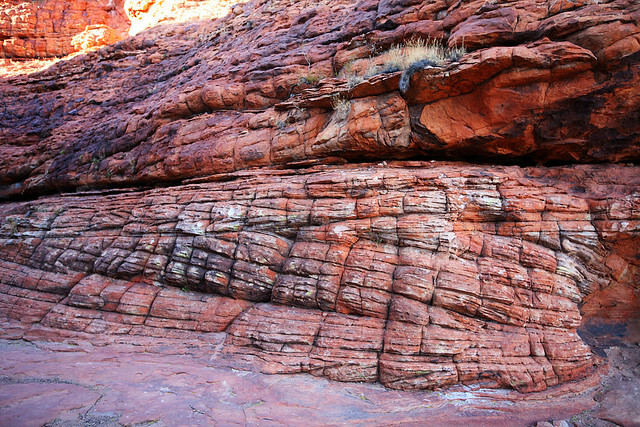 And all around the erosion by rain, wind, and sand had produced the most bizarre and fantastic shapes. One place contained an area several square metres across populated by tiny weathered rock outcrops, about 15 centimetres high, in shapes suggestive of a fairy village, with mushrooms, chimneys, and other more fanciful things. A sign indicated this formation was nicknamed "Lilliput". 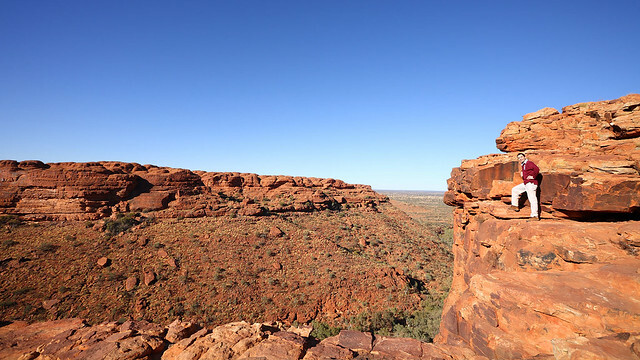 Then of course there was the main reason for coming here to Kings Canyon - the canyon itself. 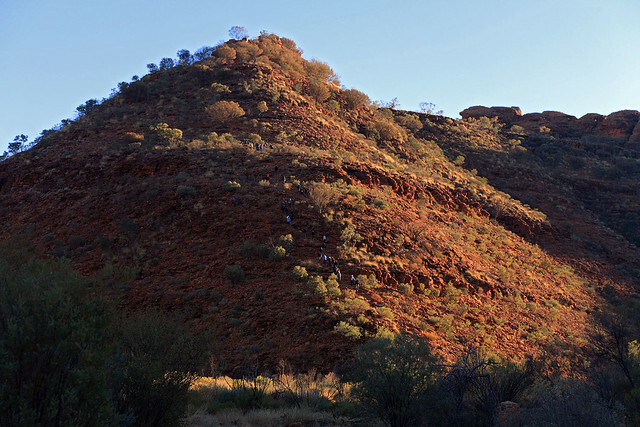 From viewpoints between the beehive domes could be seen glorious panoramic views down into the 100 metre deep canyon and across to the other side where a sheer cliff of partially polished and absolutely flat, vertical red sandstone plunged down from the plateau to the dry Kings Creek bed below. I have no idea how the face of the cliff got so incredibly smooth, but it's amazing to behold. The only bad thing was the wind, which in some places howled with ferocity, although in the more sheltered areas it was fine. And at one point I lost a lens cap and had to backtrack about 50 metres to look for it amongs the cracked and scarred rock. Fortunately I found it on the ground - I was prepared to have to give it up as lost. Continuing on the walk, we were almost always within sight of other walkers, but it wasn't crowded by any means. Several guided tour groups passed us (as we were fairly slow with a lot of photos being taken). At the midway point we crossed the canyon as it narrowed and the floor rose up towards the plateau. The crossing involved descending about 20 metres on steep wooden steps, crossing a small bridge over the now narrow gorge, and ascending steps back up the other side. The gorge here was populated by ghost gums and giant cycads - holding out in this narrow shaded zone for the rains which must flow down the canyon when they eventually occur. 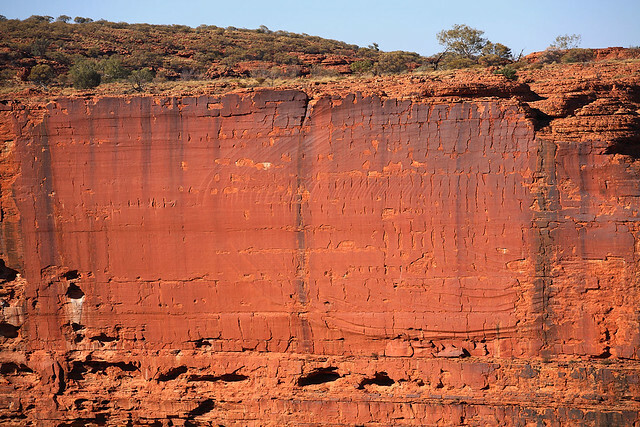 The plateau was also populated by the odd ghost gum growing on the rock, presenting a striking stark white trunk and branches, constrasting against the deep crimson red of the otherwise bare sandstone. The walk back along the southern side of the canyon involved further Indiana Jones style terrain of exposed rock and weathered beehive domes, and a cliff-top view of the north wall of the canyon - in the shade and a more normal sort of smoothly and gently curved sandstone of a subtly striped and less intense colour than the northern wall we were standing on. Eventually we made it past Kestrel Falls (dry of course) and down the stone steps back to the car park. We drove back to the Kings Canyon Resort to fill the car up (at $2.00 a litre!! ), get a coffee for M., and use the toilet facilities before setting out on the Mereenie Loop Road. The band lady at dinner last night had warned us to stick to about 80 to 85 km/h, since it was in "bad condition". 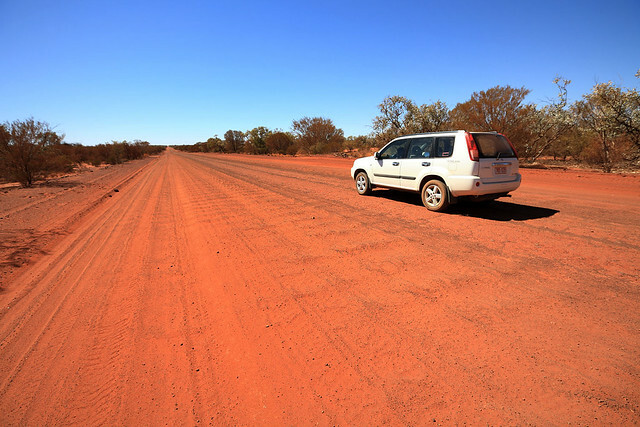 Indeed the early going was pretty rough, with deep corrugations in the gravel surface of the unsealed road causing the car to shake and rattle until we thought something might fall off. Eventually though, the road settled down and the going wasn't too tough, as we found that a speed of 110 km/h was in fact ideal for minimising the shaking. 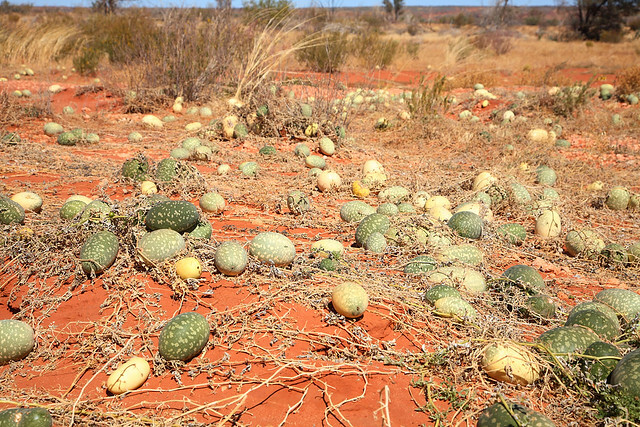 While driving, we noticed lots of paddy melons growing by the side of the road, some of the melons getting up to the size of a small watermelon. They didn't seem to be out in the untouched desert, but only along the sides of the road. We climbed a steep series of switchbacks for which the road briefly reverted to paved, and found ourselves at the "Jump Up" rest spot and lookout, which afforded a panoramic view of the desert plain below. We stopped there for some snacks of crackers and cheese, before continuing on down the other side of the range of hills and across a wide plain with gentle undulations that made the drive into a sort of slow motion roller coaster. The traffic was lighter than any other road so far, but we still passed a car every 15 minutes or so. 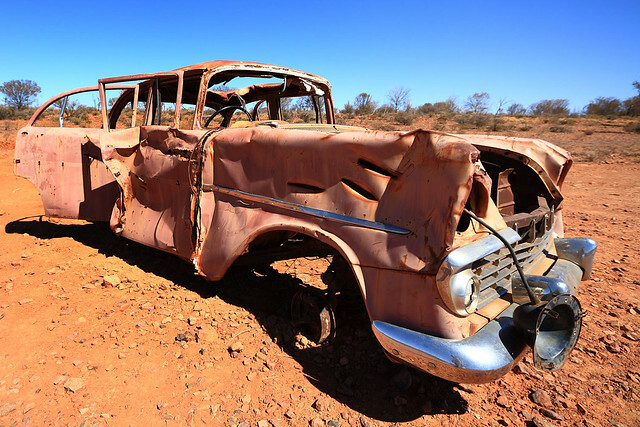 At one point there was a decaying old Holden sitting in the dirt about 50 metres off the road, which presented such an iconic and striking sight that we pulled over and turned around to go back to see it close up and get some photos. While there, a small tour bus of Germans followed us off the road and the tourists got out and copied me in taking photos of the ruined old car. The bus driver chatted to me and said he'd been watching this car decay here since the early 90s, and always brought groups out to see it. He asked me if we were going to Glen Helen and I said yes. He said he'd see us there, as that was where his tour group was going. We continued on, not taking the turnoff to Glen Helen, since we wanted to go straight on to Hermannsburg and the track to Palm Valley as a side trip. When we were almost at Hermannsburg we were pleased to see a sign indicating a photo opportunity coming up. 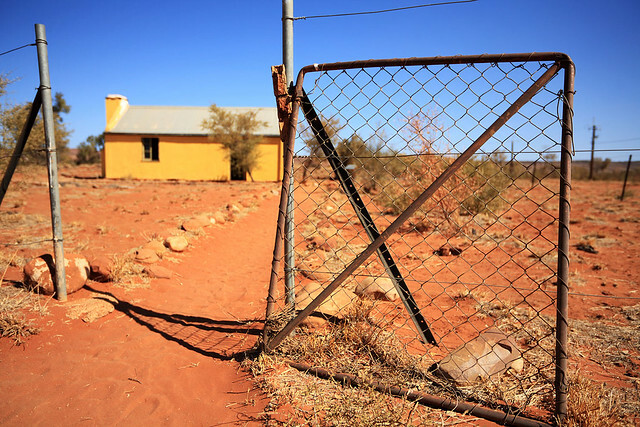 It turned out to be Albert Namatjira's house - a canary yellow painted two-room brick structure on a plot of dusty red dirt. The door was open and we went inside to be astonished at how tiny the place was, although on returning outside we could see the outline of a place about twice as big adjoining, marked by brick foundations but with no structure remaining above ground. We turned down the turnoff to Palm Valley, but stopped at a sign indicating that the route was accessible only to high-clearance four-wheel-drives - which our rental was not - and that the 5 km trip took about three hours return - significantly more than we'd bargained for. So abandoning that plan we proceeded into Hermannsburg to have a toilet stop at the local general store. Back on the road, we retraced our tracks to the Glen Helen turnoff and made good time here to the resort, stopping a couple of times for photos of the interesting hilly sandstone landscape that Almbert Namatjira made so famous with his watercolour paintings, including Mount Sonder. We pulled into Glen Helen Resort just before 17:00 and checked into our luxury room - where the lights now keep flickering as the diesel generator right outside our bathroom window audibly sputters every now and then, so I'd better finish this diary entry quickly! We booked in for dinner in the "famous" Namatjira Restaurant adjoining the reception area - being the only option for food unless we wanted to cook our own steaks on a barbecue outside. Before dinner we went for a 10 minute walk out the back of the resort to Glen Helen Gorge itself. The walk went along the pebbly bed of the Finke River - bone dry, although a photo on the wall of our room attests to the fact that at some time it actually has water in it. 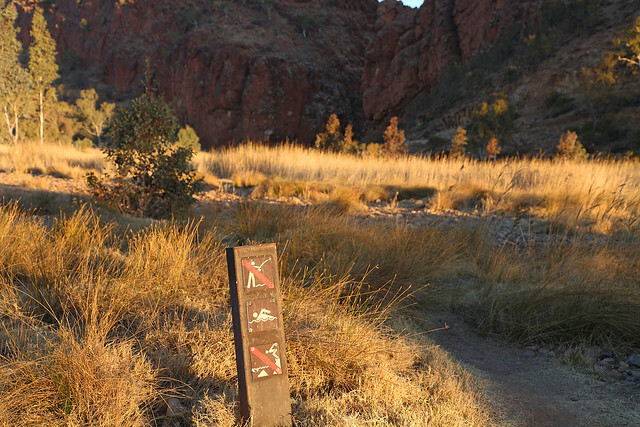 The gorge however contains a permanent water hole, with reeds and ducks, nestled between two impressive cliffs of red stone (though not nearly as big as Kings Canyon). The sun set while we were admiring this scene and then we walked back to the main building for our dinner. The reception and restaurant are in the historic Glen Helen Homestead, built in 1905 by a pastoralist who owned the property around here. The old building was charmingly maintained and furbished, and we sat in a whitewashed room decorated with prints of Namatjira paintings of the hills, gorges, and vegetation to be seen around this region. We had some damper to start, which was truly excellent. 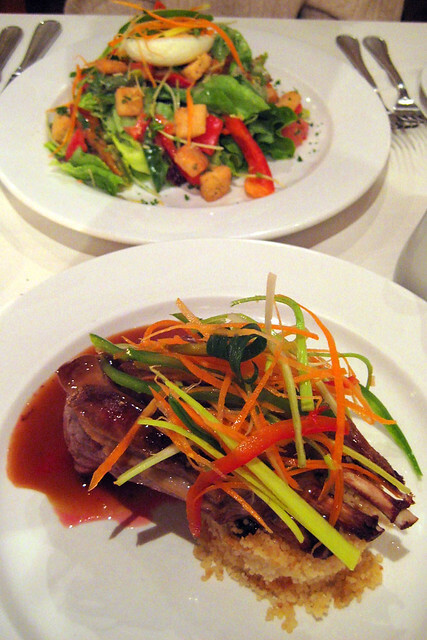 M. had one of the only two vegetarian mains on offer - a substantial caesar salad - while I had a delicious tender rack of lamb served on a bed of apricot couscous. Then I had a wild plum cheesecake for dessert while M. asked for peppermint tea. The waitress apologised as she brought out a selection of green and herbal tea bags, saying they seemed to have run out of peppermint. M. opted for chamomile instead. The dinner over, we retired to our room, first securing a hair dryer for M.'s shower by way of a $20 deposit. I returned the dryer to reclaim the $20 once M. had finished with it. There were also lots of photos to copy on to the media drive and then it's time for bed. Last updated: Wednesday, 23 January, 2019; 12:57:03 PST.